You better watch out! You better not spout! You better not slide. I'm telling you why. 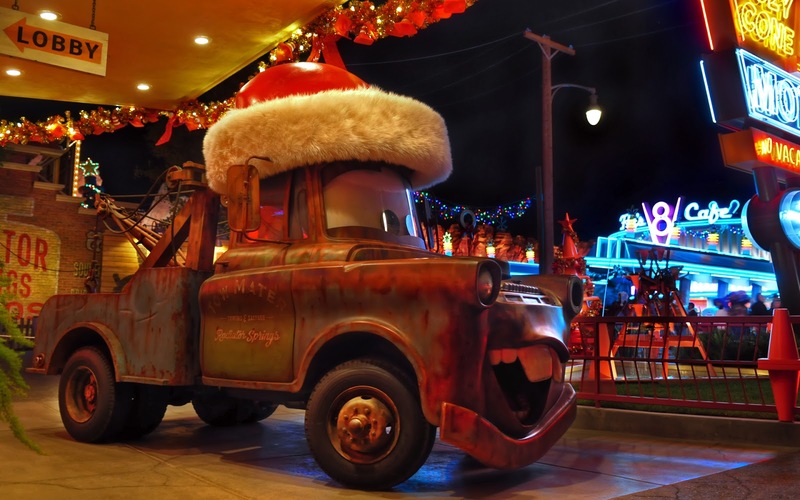 Mater Claus is coming... to town. He knows when you need towing. He knows when you can't brake. So drive safe for Cars Land's sake! Mater Clause is coming... to town!! Christmas Mater at his meet-and-greet at the Cozy Cone! Whether you love it or hate it, the Christmas season is upon us. And while it seems to happen earlier and earlier each year, and even I have to admit it's coming too soon these days, there's no denying that the Disneyland Resort does Christmas right! This year, with Disney California Adventure's new offerings come new opportunities for some great holiday theming. So over the next two months, you'll see lots of festive flare from around the Resort. And even though I'm hardly over Halloween, I must confess that I'm pretty impressed with the decorations!